Editor’s Note: This is our annual Thanksgiving article, originally published in 2013. Happy Thanksgiving from War on the Rocks! Today is all about tradition: turkey and stuffing; family, friends, and football. From early childhood, we all learn the origin story of Thanksgiving that is so mythically central to its celebration. Pilgrims in Plymouth Colony marked a successful harvest with a feast to which they invited Native Americans who had lent much-needed assistance after the previous hard winter. Records of earlier harvest celebrations and debates (google “thanksgiving origins” if you’re interested and have hours to kill) about the actual provenance of what would become our Thanksgiving aside, it is no surprise that the centuries-long history would make it the holiday most steeped in uniform tradition across America. particularly in that he hath been pleased, in so great a Measure, to prosper the Means used for the Support of our Troops, and to crown our Arms with most signal success. To inspire our Commanders, both by Land and Sea, and all under them, with that Wisdom and Fortitude which may render them fit Instruments, under the Providence of Almighty God, to secure for these United States, the greatest of all human Blessings, Independence and Peace. wisdom to [the nation’s] measures and success to its arms in maintaining its rights and in overcoming all hostile designs and attempts against it. So today, while we enjoy our Thanksgiving traditions, we should take note of the ways in which the wars that we have fought have shaped our nation not only politically, but culturally and as a society, as well. We do not celebrate thanksgiving, but Thanksgiving. We celebrate it annually, as a nation, a unifying tradition that would not exist in such a form were it not for our collectively shared experiences of the conflicts that define our history. As such, there is perhaps no better day on which to reflect on the enormously important impact of our nation’s wars — past, present, and future. The full text of Lincoln’s 1863 proclamation is included below. It has seemed to me fit and proper that they should be solemnly, reverently, and gratefully acknowledged, as with one heart and one voice, by the whole American people. 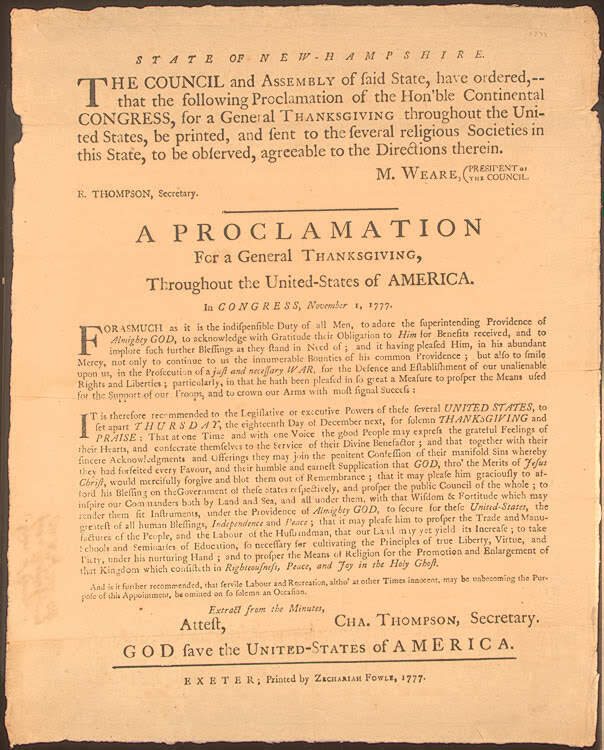 I do therefore invite my fellow-citizens in every part of the United States, and also those who are at sea and those who are sojourning in foreign lands, to set apart and observe the last Thursday of November next as a day of thanksgiving and praise to our beneficent Father who dwelleth in the heavens. And I recommend to them that while offering up the ascriptions justly due to Him for such singular deliverances and blessings they do also, with humble penitence for our national perverseness and disobedience, commend to His tender care all those who have become widows, orphans. mourners, or sufferers in the lamentable civil strife in which we are unavoidably engaged, and fervently implore the interposition of the Almighty hand to heal the wounds of the nation and to restore it, as soon as may be consistent with the divine purposes, to the full enjoyment of peace, harmony, tranquillity, and union. John Amble is the editorial director of the Modern War Institute.